Happy Birthday to Cathode Ray Tube. One year old today. 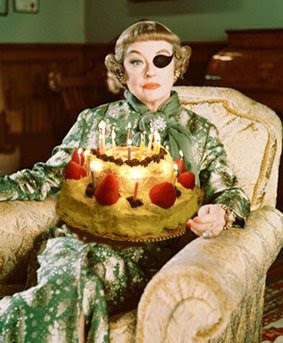 C'mon Bette, blow out yer candles or you won't get yer din dins! I do hope you've enjoyed the reviews, pictures, video and audio that's been brought to you. The blog has successfully grown and changed in the space of 12 months and I'll continue to build on this as it goes into its second year. Over 23,000 visitors isn't a bad start...and I thank all of you for visiting, even if you've just popped in to find the links to the Mad Men episodes have buggered up again! More 'Weekends With...' themed reviews will be popping up...so look out for opinions on Hammer films, Powell & Pressburger, silent horror and much, as they say, more. And by the time we get to Christmas I'll do my usual rant about the TV schedules and pick the best viewing for the festive period. I'm also looking into bringing a regular pod-cast on line, so once I've got my brain in gear and figured out the various gizmos...interweb broadcasts will hopefully commence. Fancy! Thanks to: Blogtor Who's Cameron McEwan, Rupert Smith, Rob Stickler, Alec, the Doctor Who Forum Wrinklies (they are legion), Tony at DWAS, various Squee Squads and spoiler hounds (Scooty, especially), long suffering colleagues and loved ones - without your support and hard work CRT would be a lesser force within the blogosphere. If I've neglected to mention you...sorry, must have been having a senior moment. I'll make it up to you. Honest. Happy Blogoversary Frank, keep the views and reviews coming.